Sheet metal has continuously evolved throughout history to adapt to the new performance and quality standards necessitated by makers of capital goods. The Straightening process is the first of three stages necessary to obtain a straight sheet metal and is the most requested of all, for it is the simplest and cheapest. Straightening is a very simple and quick process to obtain flat sheet metal by its passage through a number of rolls in different diameters, which varies according to the thickness of the coil to straighten. These rolls can be 65 mm, 80 mm, 100 mm or 130 mm in diameter. The choice of the best diameter depends essentially on metal width and the degree of straightness one wants to obtain. Normally, these diameters are used for a range of widths that varies from 0.5 mm to 6.35 mm, but it is also true that thinner material require more rolls than those needed for thicker ones. A straightener is a multi-cylinder machine that exerts “alternated plastic deformations” onto the materials through their rolls, whose diameter is fundamental in obtaining a good result, in relation to the width and the kind of material to process. Rolls are always odd in number and arranged in two rows: the bottom one with more rolls and the upper one, whose pressure on the sheet metal can be adjusted manually or automatically. Lower rolls are normally motorized by a gear motor, which provides the power necessary to push the sheet metal in its straightening process, while upper rolls work in neutral and are responsible for the pressure exerted on the sheet, thus determining the degree of straightness to obtain. The operator is tasked with the ability to choose the optimal degree and this is why his experience, as well as the choice of a good coil and facility rigidity can make the difference. The most used rolls disposition are 3+2 in LFC models, 4+3 in LTC models and 5+4 in LTC plus models. However, Camu’s flexibility allows devising the best solution according to our client’s specific needs. It is highly recommended to carefully clean the straightener before changing into a different type of material in order to ensure maximum efficiency and avoid any marks or blemishes on the end product. 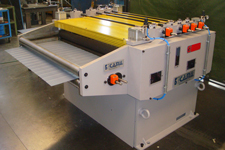 If the strip has not been straightened after cutting, the pieces obtained from the strip keep the curvature of the coil. This curvature causes considerable problems in the following working proces or assembly, problems that force the operator to discard the piece. Straightening eliminates these problems. These problems are most evident when using stepped and more complicated mould. These situations cause frequent production stops, high maintenance costs, delays in deliveries, punch and die breaks. Almost all of these problems can be avoided with good straightening. better feeding quality. 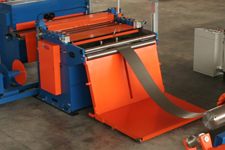 The straightening set up by the rollers on the strip reduces the tendency of the sheet to form wrinkles, achieving an improvement in quality and smooth feed. As this effect is of short duration, in order to benefit from it, it is necessary to place the straightener in front of the press.